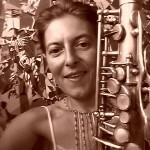 Saxophonist Nicoletta Manzini is back at KD’s with a selection of original music and standards inspired by the great masters of jazz, from Charlie Parker to John Coltrane , with love. Featuring Nicoletta Manzini–alto sax; Emile Turner–trumpet; Nobuko Yamasaki– bass; Bernard Linnette–drums. To watch a YouTube clip, click here and enjoy! And check out the new seafood menu at KD’s. Your suggested $5 donation supports the musicians and PLG Arts.